We know that one of the primary reasons most people don't want a website is maintenance. Once you spend the time and the money on getting a domain name, planning a site, designing the site, building the site... well, as if that weren't plenty to think about, then comes the upkeep! and use up your valuable time and energy, building a website, that once it's running, will never be current again? that requires more time to keep up-to-date than it took to build? Check out our hosting specials. MySiteWorx! is now available with our most popular packages! Visit our website portfolio to see some of the site using MySiteWorx! to manage their content. We have one answer to these questions: DON'T DO IT!! The Web Marketing Worx MySiteWorx! 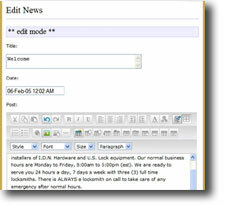 website management tool enables you, the website owner, to add, edit, and update your own website content. 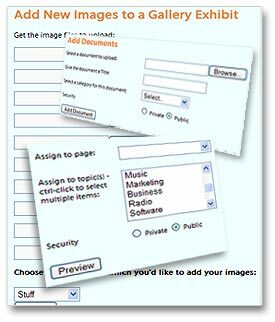 Publish news articles, post photo galleries, keep your visitors informed of what's going on in your organization using built-in E-marketing tools, all with a few button clicks. Anyone in your office can update your website! There's no need to know the ins and outs of website design and development. No special experience or education is required to understand how to use MySiteWorx!. Anyone in your office can use it, making it easy to keep your website current, fresh and valuable to both you and your visitors. MySiteWorx! is designed to provide optimum search engine tuning and makes use of common automated blog-type promotion technologies, so you get the added benefit of having improved seach engine rankings over a static site. When you are able to update your site yourself, it is updated more frequently, and a more frequently updated site gets higher Google rankings. ...all within your full control. MySiteWorx! can be added to our SOHO, Business, and Enterprise Class website hosting accounts. It's the easiest way to get and stay in business online. Already have a website? No problem. We can set up SiteWorx! for your existing website and propose an ideal Web Marketing Worx hosting plan just for you. For more information about MySiteWorx! and how it can help your organization, please contact us right away. We're anxious to help you find and keep your place on the web!